Combine all ingredients. Put desired amount of cereal into a strainer and rinse thoroughly. Add to rice cooker in 1:3 ratio of cereal to water. You can add a dash of salt and some coconut oil or butter, if desired. Set on brown rice setting for extra soft and a white rice or quick cook for a firmer texture. Add desired toppings. We love pure maple syrup, raisins and almond or coconut milk. Fresh or frozen berries and cream (if you do dairy), be creative. I have also put in vanilla or almond flavoring. Experiment and share. I do all the prep the night before. It takes 2 minutes and is piping hot for us at 7:10 am. You could do this on a stove top, cook as you would rice. A crock pot would work. I would cook a large batch in a 1:2 ratio, and just keep the leftovers in the fridge. I recommend buying your grains in bulk and mixing up a huge batch to keep in your pantry. I actually fill a 5 gallon bucket and put a gamma seal lid on. 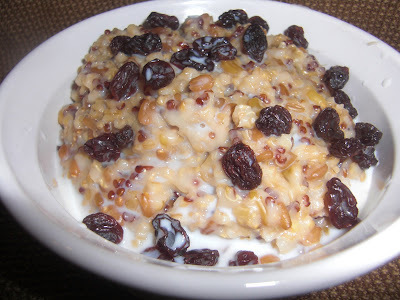 These grains are so healthy and this cereal is the perfect way to incorporate them everyday into your families diet. 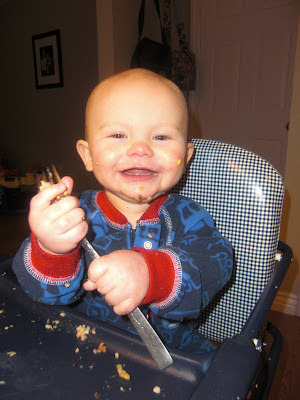 If my 10-month-old with that adorable little sharptooth, is this happy about it, you have no excuse but to try it! Feel free to add new grains and in different ratios...varying taste and texture keeps things interesting. If the cap trappers don't take the country by storm (which I think they should! ), then you definitely could with a cookbook on all of the ways you use whole grains to feed your family! It's been a goal of mine for a while and I recently got the Nutrimill and Electrolux DLX mixer to get started. I'm in the process of getting all of my grains and am SO excited! Thanks for all that you share on your blog - I may have some questions for you soon! Wow, you are inspiring. I'm going to be using your recipes....and trying to offer healthier foods to my family!! Thanks!! Uh oh- looks like I am off to buy a rice cooker now. This looks too good!